Newark Mayor Cory Booker, a guest on NBC’s “Meet The Press” Sunday to talk about his support for President Barack Obama, instead talked about his support for Bain Capital and private equity firms. In the process, Mayor Booker almost totally blew the Obama Campaign’s message. The question is why? Why would Mayor Booker do that? I believe it’s another example of what’s called the “Black Crab Barrel” mentality. The dynamic is where someone African American puts down another person who’s African American and perceived as successful, just because they’re successful and in a field not normally represented by blacks. Intentionally holding on to an assignment in order to cause work delays for a Black supervisor/manager and out of a sense that you have to be “begged,” which makes you feel important. Intentionally making false statements about a Black coworker, who has complained of race-based discrimination, harassment or retaliation. Saying there is no racism in the workplace, just because a Black person has complained about it and not because it is true. If you think about what Mayor Booker did from that perspective, motives that he may not even be aware of and that come from the crab barrel problem in American Culture were, I assert, driving him. Otherwise, why do what he did? What else would drive Mayor Booker? Consider that what he said in not wanting to point to Bain Capital in a negative way was in defense of himself, even at the expense of the Obama Campaign message. In other words, making himself look like the more desirable future candidate for President. Overall, this is a watershed moment in American Culture, and I hope one where Blacks stop feeling the desire to thwart the efforts of other Blacks to achieve or to maintain success in non-traditional areas of life. Regardless of the historic, allegedly slave-based reasons for the crab barrel mentality, it should have no place in the 21st Century. 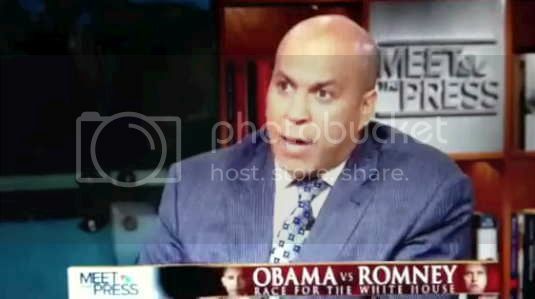 Be the first to comment on "Newark Mayor Cory Booker On “Meet The Press” Goes “Black Crab Barrel” On Obama"